As evening came, Jesus said to His desciples, "Let's cross to the other side of the lake." So they took Jesus in the boat and started out, leaving the crowds behind. But soon a fierce storm came up. High waves were breaking into the boat, and it began to fill with water. Jesus was sleeping at the back of the boat with His head on a cushion. The disciples woke Him up, shouting, "Teacher, don't You care that we're going to drown?" When Jesus woke up, He rebuked the wind and said to the waves, "Silence! Be still!" Suddenly the wind stopped, and there was a great calm. Then He asked them, "Why are you afraid? Do you still have no faith?" Mark 4:35-40 NLT. God spoke: "Let Us make human beings in Our image, make them reflecting Our nature so they can be responsible for the fish in the sea, the birds in the air, the cattle, and, yes, Earth itself, and every animal that moves on the face of Earth." Prosper! Reproduce! Fill the Earth! Take charge! Be responsible for fish in the sea and birds in the air, for every living thing that moves on the face of Earth..."
28 And God BLESSED them, and God said unto them, "Be fruitful, and multiply, and replenish the earth, and subdue it: and have dominion over the fish of the sea, and over the fowl of the air, and over every living thing that moveth upon the earth. 30 ...and every thing that creepeth upon the earth..."
creep along the earth don't they? and all that is ours. But that authority does no good if you don’t use it. Those of us, who have a covenant with The Father by asking Jesus into our hearts, have the right, because we have now been made the Righteousness of God through Christ Jesus. It’s nothing we did! It is what The Father did for us when we accepted Jesus into our hearts. Righteousness means we have right standing with God. Our debts/sin were paid by Jesus, so now we can boldly come to The Throne and stand in front of God and make our request be made known to Him. Hebrews 4:14-16, and Jesus is at God’s right hand making intercession for us. One way to approach the Throne of God is through prayer. Another way is to take Communion at home. That’s right you and your family can take Communion at home! When there are storms approaching (of any kind) take Communion over it and command it to dissipate in the Name of Jesus. How do we receive Communion? A group of people can partake or an individual, because one person plus God makes two! When we take Communion we are honoring, celebrating and paying tribute to what The Lord Jesus Christ did for us. Holy Communion is a way to intimately come into the presence of The Father. We practice it in our home often, especially when a problem or concern is approaching or has manifested. Some ask if it is okay to take Communion at home since most people this day and age do it at Church. It’s almost like there’s a mystic surrounding it. Well it is time to take it back. The early Christians met at homes to fellowship and “break bread” or observe The Lord’s last supper, you know Communion. In 1 Corinthians 11:23-24 we see Paul addressing the Corinthian Church concerning the taking of the Lord's Supper. That is Communion. On the night when he was betrayed, The Lord Jesus took a loaf of bread, and when He had given thanks, He broke it and said, "This is My Body, which is given for you. Do this in remembrance of Me." In the same way, He took the cup of wine after supper, saying, "This cup is the new covenant between God and you, sealed by the shedding of My Blood. Do this in remembrance of Me as often as you drink it." given of The LORD in your own home. enough for everyone. Pass out the bread to all who are present. asking Him to be a part of and what you're praying for. before it can get to you! Now, before you take Communion examine your hearts. Read 1 Corinthians 11: 27-33. It says not to take Communion unworthily but to examine your hearts, see were you have “missed the mark,” ask forgiveness then you’re ready. The person administrating Communion should now read Luke 22:19, "And He (Jesus) took the bread, gave thanks (now give thanks for the Body of Christ) and break it, and give it to them, repeating what Jesus said, "This is My body given for you; do this in remembrance of Me." Everyone eats the cracker or bread at this time. After the bread has been eaten, Read Luke 22:20, "In the same way, after supper He (Jesus) took the cup, saying, "This cup is the New Covenant in My Blood, which is poured out for you." Then thank The Father for the Blood of Jesus. The cup is now passed to each person to take a sip, don’t forget to receive it yourself when the glass comes back to you. Close with thanksgiving or even singing songs of praise together. but this is the basic way to partake of The Lord’s Supper. which is located in Destrehan, Louisiana, were rebuking the hurricane (along with many other Ministries and Christians) coming straight towards them. Even though the hurricane still came, it weakened greatly the closer it got to Brother Duplantis’ Ministry property. The only damage to JDM buildings was a fallen tree branch which he stated he wanted that branch down anyway. at they right hand; but it shall not come nigh thee. The Full Armor we have been given to stand on. The angels have been given to us. Psalms 91:11 For He shall give His angels charge over thee, to keep thee in all thy ways. We've been given The Name of Jesus. Proverbs 18:10 The Name of The Lord is a strong tower: the righteous runneth into it, and is safe. We have been given the Tithe. God will rebuke the devourer for our sakes. Malachi 3:10-11 Bring ye all the tithes into the storehouse, that there may be meat in Mine house, and prove Me now herewith, saith the LORD of hosts, if I will not open you the windows of Heaven, and pour you out a Blessing, that there shall not be room enough to receive it. 11. And I will rebuke the devourer for your sakes, and he shall not destroy the fruits of your ground; neither shall your vine cast her fruit before the time in the field, saith the LORD of hosts. Stand on Psalms 91. Get it down into your heart and mind reviewing and speaking it over you and yours DAILY! Stand on Isaiah 54:11-17. No weapon formed against you shall prosper. "I am a child of THE MOST HIGH GOD and you have NO CLAIM on me! For IT IS WRITTEN~NO Weapon formed against us shall prosper! And NOW IT'S SAID, PEACE BE STILL! In The Name of Jesus ~ DISSIPATE NOW! You stay away from here, my loved ones and property! I've been given reigning, ruling, power and authority over the creeping crawling things on this earth, and that includes you tornado. Be gone in Jesus' Name. I Plead the Blood of Jesus over myself and all that is mine NOW. You will not cross this Blood Line! This absolute barrier of protection of Jesus' Blood! NOW DISSIPATE IN JESUS' NAME!" Speaking The Word gives angels something to work with! God wants His children to talk like Him and take AUTHORITY! 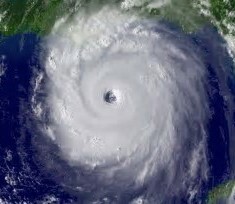 Begin building up your faith by using the www.weather.com website of the storms in your area. Speak to these storms as you see them going across the Doppler radar. This is a good way to practice and build up your faith as you see these storms begin to obey you. Faith needs to be built up just like a muscle needs to be built up! God in Heaven, I come to You in the name of Your Son, Jesus. I confess that I haven't lived my life for You. I believe that Jesus is the Son of God. I believe that He died on the cross and rose again from the dead so I might have a better life now and eternal life in heaven. Jesus, come into my heart and be my Lord and Savior. From this day forward, I'll live my life for You to the best of my ability. In Jesus' Name I pray, Amen. delight to hear from you! 10-12 And that about wraps it up. God is strong, and He wants you strong. So take everything The Master has set out for you, well-made weapons of the best materials. And put them to use so you will be able to stand up to everything the devil throws your way. This is no afternoon athletic contest that we'll walk away from and forget about in a couple of hours. This is for keeps, a life-or-death fight to the finish against the devil and all his angels. 13-18 Be prepared. You're up against far more than you can handle on your own. Take all the help you can get, every weapon God has issued, so that when it's all over but the shouting you'll still be on your feet. Truth, righteousness, peace, faith, and salvation are more than words. Learn how to apply them. You'll need them throughout your life. God's Word is an indispensable weapon. In the same way, prayer is essential in this ongoing warfare. Pray hard and long. Pray for your brothers and sisters. Keep your eyes open. Keep each other's spirits up so that no one falls behind or drops out. you with favor as a shield! "Don't talk about the weather. Talk to the weather!" ...He that hath seen Me hath seen The Father. ...Believest thou not that I Am in The Father, and The Father in me? The WORDS that I speak unto you I speak not of Myself: but The Father that dwelleth in Me, He doesth the works. Many of the laws that govern this earth today came into being when Adam sinned and the curse came upon the earth. Because people don't understand this, they accuse God of causing accidents, sicknesses, the death of loved ones, storms, catastrophes, earthquakes, floods, etc. Even insurance policies call such things "acts of God!" They are not acts of God! They are acts of the devil! Jesus set aside these natural laws to bless humanity. We don't see Jesus bringing any storms on people. In fact, we see Jesus still the storms. Therefore, God didn't send the storm. Jesus wouldn't rebuke something God did! But Jesus did rebuke what the devil stirred up. When you see Jesus at work, you see God at work. Jesus' description of The Father, and His statement that "...he that hath seen Me haths seen The Father..." (John 14:9) make it impossible to accept the teaching that accidents, sicknesses, the death of loved ones, storms, catastrophes, earthquakes, floods, etc. are from God. The very nature of God refutes such an idea. Confession: God is Love. And I don't blame Love for what the devil does. I look at Jesus, and I see Love at work. ...And they awake him, and say unto him, Master, carest thou not that we perish? And he arose, and rebuked the wind, and said unto the sea, Peace, be still. A tornado arose one spring day in Texas. Most people had gone onto their storm cellars. We didn't have one. I was bedfast and almost totally paralyzed anyway. I became fearful. If the tornado were to strike, it would strike my corner room first, because the wind was coming from that direction. The house would cave in right where I was! In desperation, and without thinking whether or not I could do it, I said, "Dear LORD, I'm Your child. When those deiciples were about to sink, they awakened You and said, 'Carest thou not that we perish?' And You did care. You awoke and rebuked the wind. I know You don't want me to perish, but I can't get out of here. I'm here on this bed, and this wall is about to blow in on top of me. So I now rebuke this storm in Jesus' Name!" As fast as you'd snap your fingers, the storm stopped. It grew calm. I rejoiced. I didn't know then the great truths about the believer's authority. I had gotten to the edge of it and had exercised it without really knowing what I had done. But God wants us to get the revelation of the truth of His WORD so we can understand what belongs to us and use it in our lives. over whatever we want protected. These instructions below are a basic example of placing The Blood line of Jesus Christ around your property before a hurricane, tornado, and storms in the natural or in your life. You can adjust this example to fit your need. 1. Have one or more ounces of olive oil in a bottle with a tip. (We use a hair coloring bottle). Then prepare for communion. Please see on this page below, “Be Prepared Ahead Of The Storm!” You will see a basic guideline on how to partake of communion. Place your bottle of Olive Oil in line with The WORD (Your BIBLE), The BLOOD (grape juice) and The BODY (Cracker) of Jesus Christ all aligned in front of you. This will Anoint and place THE BLESSING of God on the Oil. Then continue with communion. 3. Please see videos below on The Authority of The Believer. and wherever our feet are standing - we are standing in the land of Goshen! Thank You LORD for doing great things for us! AMEN!